This is one of my favorite places to paint in Bay View. The light is always changing and the garden is doing something different every time I go there. Move three feet one way or the other and the view and perspective of the quirky buildings change. Zoom in, zoom out . . . The garden is right behind the Woman's council building with a good view of the museum buildings just a few feet away. 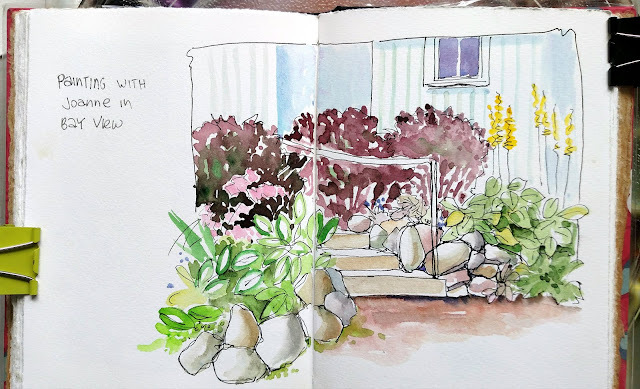 I did this watercolor sketch at least a month ago, and now the sun and the garden have really changed. It's very dark and windy today. I'm all about comfort - I won't be going out painting. Do you have any creative plans for the weekend? Lovely sketch and it would be my place if I lived there! I live in Pa. close to the mts. There is a lovely cafe that always has the prettiest seasonal decorations. It is my goal to try and paint one of the views. Becky - that sounds fun! Just planning to sketch gets our creativity going, doesn't it? I am an artist living, teaching, and painting in a beautiful, small, resort town on Little Traverse Bay in Northern Michigan. My creative passion is watercolor sketchbook journaling. On this blog I will post things that I am working on and things I am teaching in my classes. I Hope you find something to make you smile.